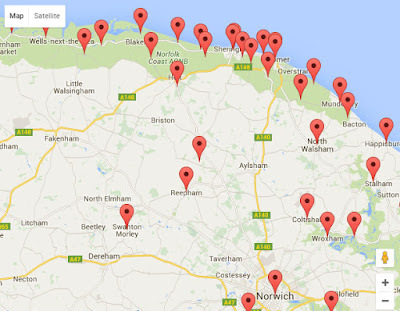 As an aid to navigating and finding a map specific to your geographical requirements, we have generated a Google map of all Norfolk walks that are detailed on this site. The map below is zoomable and uses icons to locate each walk, specified on the geographical location of either the start/end of the walk or its main feature. Click on any icon to display a brief description which contains a link to the full walk details.